Discover the Minoan civilization and the magnificent nature of Crete. Feel the mild climate of the most south island of Europe in the middle of Medditerranean sea. Relax... enjoy bath in the Cretan sun while refreshing in our crystal clear water pools. 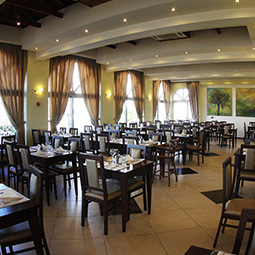 Experience the traditional cuisine and excellent service together with the Greek hospitality. 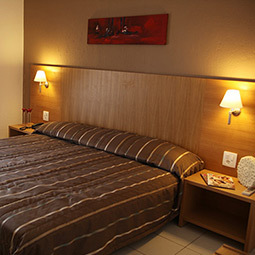 Europa Beach Hotel offers a relaxed and comfortable atmosphere for couples and families looking for a quiet holiday. The hotel is just a 10 minutes sea side walk from the village of Analipsi in the district of Hersonissos with the non stop night life. Main restaurant (air-conditioned, no smoking), terrace, snack bar, lobby bar, pool bar, mini market - souvenir shop, TV room, mini club, wellness center, children's playground, gymnastics room, tennis court and volley-basket court, open air animation theater 350 seats, indoor animation theater 180 seats. Tennis, aerobic & aquarobic gymnastics, volleyball, basketball, table tennis, darts, boccia, billiards, water polo and other water games. One fresh water swimming pool, one sea water swimming pool and two shallow children-pools. Loungers and sunshades at the pools are free of charge. At Europa Beach hotel entertainment involves you. Either with our Cretan folklore evenings or our special shows our aim is to get you into the action. Daytime activities: morning aerobic and aquarobic gymnastics, water polo, volleyball, basketball, darts, boccia, water games etc. Evening activities: show programs, dancing nights and game shows. Mini club (4-11 yrs old) with playground. Every day several hours children supervision and animation in the morning and afternoon during the whole season. Cretan folklore evening, Greek evening and special shows.